Sheba, the wolfgirl, had never known anything other than her cage in the tiny room that she lived in at Grunchgirdle’s World of Curiosities. Until one day she is bought from Grunchgirdle by a beast of a man, Plumpscuttle, and shipped down to London for a new live. At first its exciting, Sheba has never seen London before but cant wait to view her new life. However when she, Plumpscuttle and his band of freaks reach the city they are greated with bad news, someone is taking the mudlarks; London’s lowest of the low children. When Sheba’s new friend Till goes missing she and the other freaks know that they have to help find her and set off on a dangerous adventure. I was exciting by the idea of Freaks as soon as I heard about it and I cannot believe it’s taken me so long to read. At just 250 pages its a short but memorable book which left me begging for more. The story is set in Victorian London, which is one of my favourite periods in historical MG/YA. I loved the imagery that Larwood used when it came to the fog, the squelching mud and the monstrous buildings which Sheba says when she first gets there. London from that time seems a world away from our modern day London, but its still so easy to picture. The story centres around the missing children and the freaks’ search for them however there are also aspects of family, friendship and belonging. Each of the freaks feel like they don’t belong, especially Sheba, and it takes her a while to settle in with this new group of people. There’s also mention of the baby farms of Victorian London, the new inventions that are enhancing the world’s technology and the wonderful architecture that has started to pop up, like Crystal Palace. 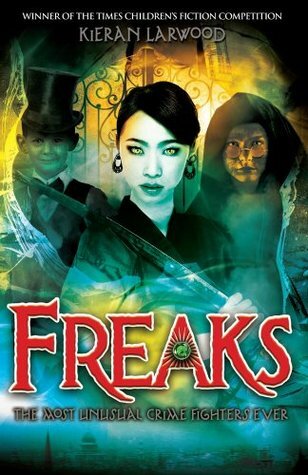 Freaks is like a history lesson in all it teaches you about the Victorian era, but a fun one with cool people and a crime that needs to be solved! The characters were awesome, with the exceptions of the baddies and the freaks keeper, Plumpscuttle. I loved each and everyone of the freaks and loved that they all had their own personalities. Gigantus with his writing and his soft side even though he was a strong man. Mama Rat and how she took care of her rats and the other freaks as if she was mother to them all. Sister Moon, he amazing powers and her sensitivity and finally Monkeyboy and his humour. They were all brilliant and although Monkeyboy does need to learn when to be quiet and do as he’s told I still loved him. Larwoods world is full of adventure and mystery and I think any child in the 11+ bracket would love this book. The humour had me laughing out loud and the danger had me hoping that Sheba and her friends would be ok. It really does have an impact on you and with great writing and that beautiful cover its a perfect last minute gift idea for Christmas. Freaks was published by Chicken House in April 2012. An illustrated hardback copy is due for publication early next year. My copy was gifted to me.